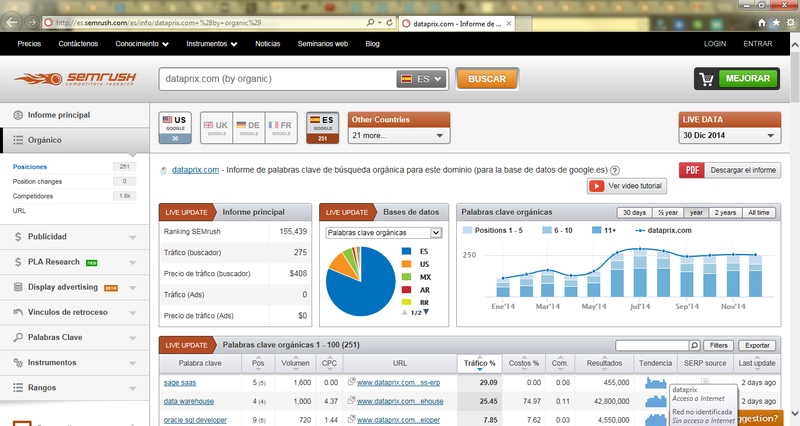 SEMrush is one of the best tools of SEM and SEO for marketing online professionals. If you are a professional of online marketing, either offering services of SEM and SEO positioning to third parties, or belong to the marketing department of a company that invests in Adwords, I am convinced that after trying it you can't stop using it. And if not, certainly in these two-week trial you will be able to easily improve the ranking of your website or your blog, and find keywords that bring you more visitors. You'll be able to find out who are your real competitors in search engines results, even in sponsored results, which monthly budget is spending your competitors in Adwords campaigns, and what keywords they use to attract potential customers. You can even see the ads of your competitors, and study their message and their landing pages, which will allow you to redefine your online marketing strategies knowing better what your competitors are doing. If your competitors have done a good job in SEM and SEO, with SEMrush you will be able to take advantage of their efforts in analysis and keywords optimization, ads and landing pages for your own benefit. If you do not know SEMrush we have published on Dataprix an online tutorial than includes several videos on how to use it. You will discover that the tool is very intuitive, and you will get valuable results right away. In the manual you have more details, and the main reports provided by this software explained, as the main report domain, the report to analyze a specific web page (URL), the report of keywords for organic positioning, and keywords for Adwords, and the comparative graph of SEM and SEO evolution different domains. You can use SEMrush to get better results in your SEM campaigns and organic positioning, and outperform your competitors, or at least catch up them quickly. These 2 videos show how to use SEMrush to obtain valuable information about your competitors and their keywords. Who are my competitors in Google search results, organic and paid? What keywords we are competing with them? What is our position and what yours for each keyword? Do we have possibilities to position ourselves better than our competitors with the keywords you have in common? In this video tutorial we show a practical example about how SEMrush know who are our competitors online, on SEO and adwords, and how to obtain and analyze the keywords that are bringing them organic traffic, and keywords that they are using in their Adwords campaigns. In this way we can analyze whether we can compete with them with the keywords that bring them more visits by organic positioning, and we can also incorporate our Adwords campaigns keywords that are bringing them customers, or that are accurate to our marketing objectives. This part is especially useful if our competition, which should obviously have similar objectives to ours has done a good job on keyword analysis, work of what we will take profit in just a few minutes.